Himachal was one of the few states that had remained largely untouched by external customs. Palak paneer is an Indian dish consisting of spinach and paneer (Indian farmers cheese) in a thick curry sauce based on pureed spinach. 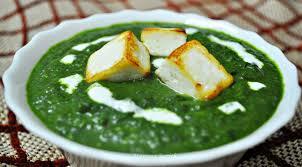 It is a popular vegetarian dish.Palak paneer is one type of saag, which can also be made with mustard leaves. Palak paneer may be somewhat more watery than saag paneer.